All classes are subject to change - there must be a minimum of 7 students to make a class. For the best experience of true community music playing, students are expected to commit to the entire series. Dates: February 6, 13, 20, 27, March 6, 13, 20, April 3, 10, 17, 24.
at the Asheville City Market. We will be raising money for marimba maintenance. All students from this session will have an opportunity to perform at the market. *The instructor will decide which class your student would be most appropriate for your child. Dates: February 5, 7, 12, 14, 19, 21, 26, 28, March 5, 7, 12, 14, 19, 21, April 2, 4, 9, 11, 23, 25. Sue Ford, former director of Evergreen’s EMBE Marimba Band, is launching a new venture called Village Marimba. Sue continues to spread the joy of playing marimba music in a community ensemble. Classes will be available to students from any school (in Grades 5 - 12) in Western North Carolina. 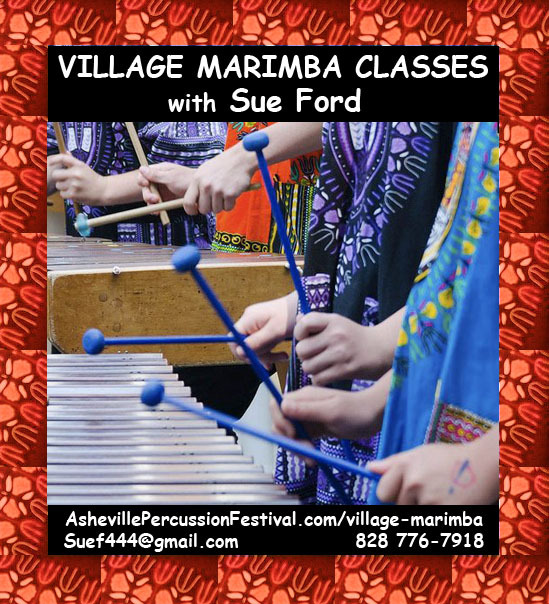 Village Marimba is a program of Asheville Rhythm, an organization that seeks to create a culture that promotes wellness through rhythm and bridges musical traditions through innovative collaborations. Learn a repertoire based on the group’s interest, including popular songs, multicultural songs and original music. Work on proper mallet/stick technique, which is also applicable to other percussion instruments. Have fun making music with other young people and their friends. Work toward a big performance at the end of the session.